The Memory Hole just posted links to thousands of inspection reports. They’re research facility inspections for 2000 through 2007. Trump and his minions just don’t understand the way the internet works. If they build a wall, we’ll put a hole into it. When I get any new info from the FOIA request or HSUS’s action, I’ll post an update. If I find more documents, I’ll post a link to this post. Today, HSUS filed a Notice of Violation of Court Order with the Department of Justice because of the USDA pulling the APHIS records. I did not know that the HSUS had filed a lawsuit years ago forcing the USDA to provide access to its inspection records for universities and research labs. By pulling these records, the USDA is in violation of the court settlement. As noted in the letter, pulling these records also runs counter to government transparency requirements established by Congress. It’s becoming increasingly obvious that the impetus for this action was the short-sighted, mean-spirited actions of Trump’s transition team. In addition, the HSUS noted in its story on the filing that the USDA finally did pull the license of several breeders in Missouri…including Rabbit Ridge. Rabbit Ridge is finally done. The Humane Society is one of the groups we need to donate to, to protect animals and the environment during a Trump administration. Delcianna Winders posted a folder containing several USDA APHIS enforcement actions. I was surprised to see an enforcement action against Donald Schrage of the infamous Rabbit Ridge kennel. The violations listed in the enforcement action aren’t unusual for Schrage. This is just a normal year’s worth of writeups for him. It’s good to see that the USDA finally yanked his chain. I’ll be filing a FOIA to find out what happened in this case, and if he’s still licensed. Normally, a quick visit to a web site and a bit of search would have returned the information. Not anymore. After writing yesterday’s post, I’m less sure that the Farmer’s Bureau et al court case triggered the USDA APHIS to pull the AWA database. The USDA APHIS just invested in a new system that was only rolled out in August. They have been redacting private information from the inspection reports. They could continue and upload new inspection reports as they finish. This action has Trump written all over it. Trump had appointed Brian Klippenstein to his agriculture transition team. Klippenstein is a compatriot of Forrest Lucas, who funded the effort to gut Proposition B, the anti-puppy mill bill, in Missouri. As of January 17, Klippenstein was the only person on Trump’s transition team for the Department of Agriculture. I’m anxious to read the documents turned up by Delcianna’s FOIA request for communications related to this decision. 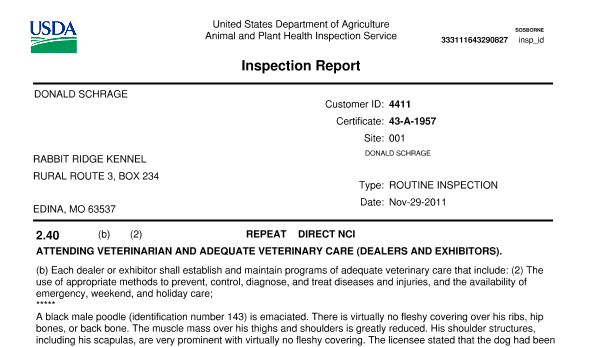 For many years I and many others have had free and open access to USDA APHIS Animal Welfare Act inspection reports. The Humane Society of the US uses the data to compile its list of the 100 worst puppy mills in the United States. I’ve used the records to highlight the atrocities of one of the worst puppy millers in the US: Donald Schrage’s Rabbit Ridge Kennel. APHIS, during the past year, has conducted a comprehensive review of the information it posts on its website for the general public to view. As a result of the comprehensive review, APHIS has implemented actions to remove certain personal information from documents it posts on APHIS’ website involving the Horse Protection Act and the Animal Welfare Act. 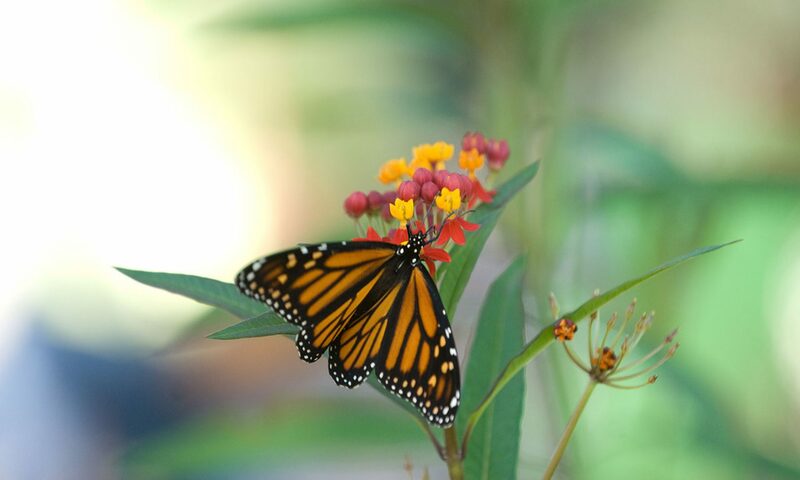 Going forward, APHIS will remove from its website inspection reports, regulatory correspondence, research facility annual reports, and enforcement records that have not received final adjudication. APHIS will also review and redact, as necessary, the lists of licensees and registrants under the AWA, as well as lists of designated qualified persons (DQPs) licensed by USDA-certified horse industry organizations. Bloomberg is probably the only news organization expressing the same concerns I have expressed related to this FOIA lawsuit, and the Judge’s decision to allow questioning of Hillary Clinton. The court said yes again. Here’s where the case — and the court — began to go seriously off track. A FOIA suit seeks information from the government, not from its former officials. The State Department didn’t thwart the law, surely. And even if Clinton wanted to avoid disclosing documents, that’s not an issue for the court in this FOIA case. FOIA provides for no remedies for failure to comply, other than a court order to do so. Good stuff. But then it turns around and says, well it’s partially Clinton’s fault because she had the server. No, it’s not Clinton’s fault. Her having private email is no different than Colin Powell having private email and probably 100s of government officials having private email. Having private email is not a valid reason for a Federal Judge violating the parameters of his duty. Or for Judicial Watch making a livelihood out of FOIA requests. I’m still bugged by Judge Emmett Sullivan’s recent decision in one of Judicial Watch’s Freedom of Information Act (FOIA) lawsuits. He should never have allowed Judicial Watch to submit written questions to Clinton. It’s a given that Clinton will respond with yet another reply of, “It was for convenience”. Tt’s also a waste of everyone’s time. More importantly, Sullivan had no justification acceding to Judicial Watch’s demand. His decision was an abuse of judicial discretion. There’s a great deal of confusion about what the FOIA really is, and does. Its purpose is to increase government transparency. The mechanism for doing so is a FOIA request. There are rules related to how a request is answered, what material is exempt, and timelines for a response, etc. If you’re an organization like Judicial Watch, which makes a living related to its FOIA requests, you can also sue if the government doesn’t drop everything and respond immediately. However, the FOIA is only related to a government’s search of existing records. It has nothing to do with ensuring that records are maintained. The only justification for allowing depositions in a FOIA lawsuit is if the Judge believes the answering organization is attempting to thwart a FOIA request. The State Department has already established it didn’t initially search Clinton’s records in response to the original request because it didn’t have access to those records. When Clinton turned her emails over, State voluntarily agreed to re-open the FOIA lawsuit and search the newly obtained emails. The State Department is also searching the records recently discovered by the FBI. That it didn’t do so earlier is because the new records were either deleted as personal (or inconsequential) or are records pulled from other people’s email accounts. At no time did State attempt to hide the records, or deliberately thwart an attempt to recover the documents. To establish that State was not thwarting the FOIA request, the only appropriate people who should have been deposed were those directly related to the FOIA search. Hillary Clinton is not involved in the State Department’s FOIA search. She’s no longer a State Department employee. And from a FOIA perspective, it doesn’t matter, at all, why she used a personal email server. Not one bit. Now, the storage of records is related to the Federal Records Act. Did Clinton violate the Federal Records Act? No, she didn’t. She never removed records from the State, as the emails were never stored at State. She used a personal email account, but that’s not a violation of the Act. The only individuals forbidden in using a personal email account are the President and Vice-President and their immediate staff. And she turned the records over to State as soon as she realized she was supposed to turn the records over to State. Again, to emphasize the point, why she used a personal email address is irrelevant, even to the Federal Records Act. Clinton’s lawyers could have appealed Judge Sullivan’s decision, and I strongly suspect they would have won. Of course, they didn’t because everyone would clamor, incessantly, about what does Clinton have to hide, why is she against transparency, and so on. However, if Judge Sullivan had demanded that Clinton be deposed, then they would have appealed. Judge Sullivan likely knew this, which is why he limited Judicial Watch to written questions. That Judge Sullivan took a less controversial approach to Judicial Watch’s request doesn’t alter the fact that the law has been abused in this case. Judicial Watch has not once in all of its depositions established that the State Department was deliberately attempting to thwart the FOIA request. There is no justification—none—for not denying Judicial Watch’s obviously politically-motivated request. Judge Sullivan should never have granted Judicial Watch’s request. By doing so, he’s unnecessarily adding to State’s FOIA burden. And he’s arbitrarily inserting himself into this year’s Presidential election. All of this is moot. The State Department just filed a status update, stating that it has searched the new records and found nothing related to Judicial Watch’s FOIA request.